Welcome to the first in my series of Pride Month book reviews! During the rest of June, my goal is to review 2-3 books per week with LGBT+ main characters and themes. Some books handle this really well, and some don't. Personally, I thought Star-Crossed was adorable and handled all of this particularly well...and part of that comes from it being a middle-grade novel! So, middle-grade novels tend to target middle-school audiences, usually kids between 10 and 14 years old. It's the age category right below young adult. While the past few years have presented a decent amount of LGBT+ representation in the young-adult genre (though, I'd argue, still not enough compared to the overflow of straight romances we get in young adult all the time), middle-grade novels still have not seen much of this. The only other one I can think of off the top of my head is The Misfits, and that book came out about 20 years ago now. It was my favorite book in middle school, though, so maybe that says something. 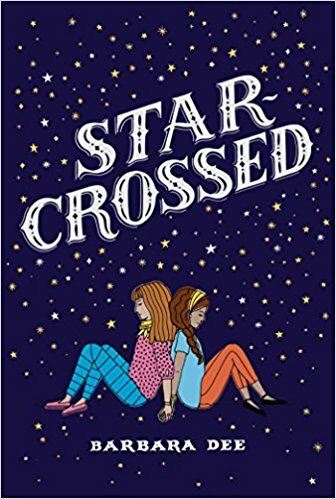 Anyway, I first learned of Star-Crossed about a year ago. It may have been during a bit of controversy that surrounded it, in which the author Barbara Dee was asked not to talk about this book during one of her school visits. You can read her post about that here. So there were a lot of things I loved about this book! First, it brought me right back to my own middle-school theater days. I really related to the character of Tessa, Mattie's best friend, because she was way too loud and enjoyed yelling Shakespearean insults at people. That was definitely my weird idea of humor at 13, too. The other thing I loved about this book was how it directly addressed the idea of bisexuality. That seems so incredibly obvious, but I'm really struggling to find media (whether books, movies, TV, or anything else) that discusses the fact that yes, it is possible to be romantically/sexually interested in more than one gender. About a year ago, I did a review of Carry On, which is arguably one of my top five favorite books about all time. However, my only negative of that book is that the word "bisexual" is not used once. In a book where the main character literally has long-term relationships with both male and female characters over the course of the story. But that book's getting a sequel, so I'm just praying it'll finally be addressed there. Anyway, my point is, even in the places where it seems most obvious, somehow lots of different types of media still like to shy away from this, and I can't really understand why. But I thought this book handled it really well. I think a major barrier to introducing LGBT+ topics in books aimed at younger readers is that some adults claim kids are "too young for that." This book, however, does a great job of showing how those topics do not have to be sexual in nature. Middle schoolers go on dates with each other. That's part of life. I went on dates in middle school. It was awkward and weird. I definitely wish I had a book like this to read when I was 13 and realizing that I liked girls too. My only negative for this book was that I thought all the "mean-girl drama" with Willow and her friends was unnecessary. I was in middle school a little over a decade ago, and even then I remember thinking this idea of "popular girls" and all that was already a little outdated. I have a theory that this idea of "regular girls" looking up to "popular girls" and "wanting to get invited to their parties" was really just an 80s thing, and since most authors writing middle-grade and YA now were teenagers in the 80s, they still think it's like this. I might be totally off base, though. Maybe I was just really oblivious in middle school. Anyway, I do highly recommend this! It's a great book, super cute, and any Shakespeare nerds out there will have a ton of fun reading this. I'll be back in a few days with my next Pride Month Book Review, which is going to be Simon vs. the Homo Sapiens Agenda by Becky Albertalli. See you then!